Alison has kindly shared the displays she has created to go with a library scavenger hunt. Thanks for this Alison, it looks like it was great fun! '﻿I work at the Carver Library in Baton Rouge, Louisiana. It is a small community branch, and part of the East Baton Rouge Parish Library system. Our summer reading theme for the teens was "Own The Night", and our programs throughout the summer were mostly night-time themed. For our end of the summer activity, we decided to have a scavenger hunt for the teens. 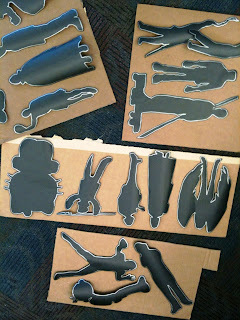 We had a bulletin board display, with shadow character cut outs of Harry Potter and Katniss Everdeen (picture 1). On the bulletin board, we put up flyers for each of the programs we held throughout the summer. Later in the summer we initiated the scavenger hunt. 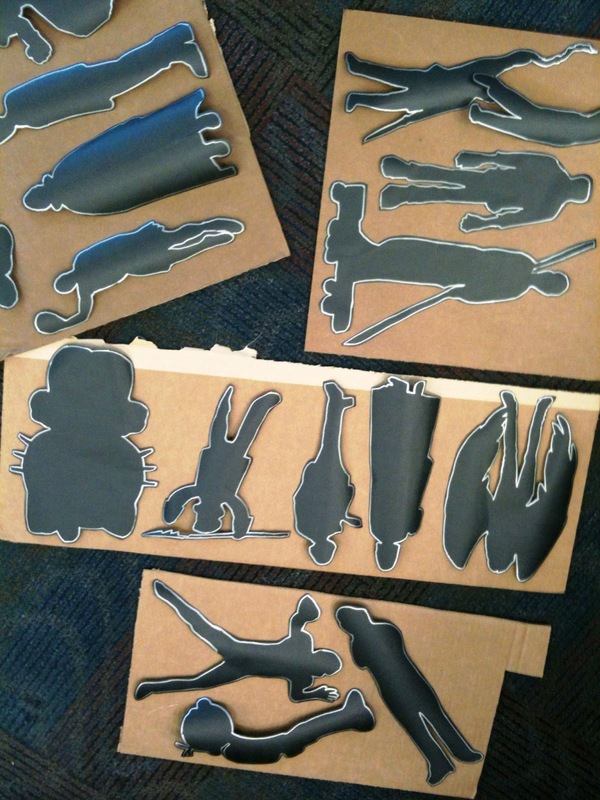 We traced and cut out literary, pop culture, and sports characters onto black paper with cardboard backing (picture 2). 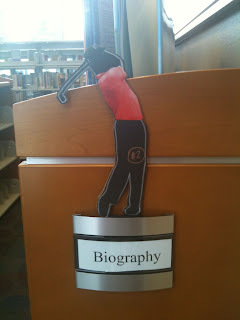 Then we placed the shadow cut outs strategically throughout the library. You will notice in the pictures that the character's clues are nearby. I included a picture of the flyers (picture 7). 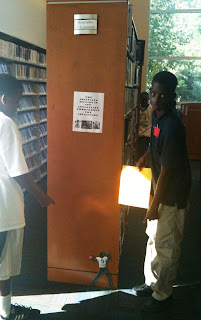 And finally, here is a photo of two of our teens working on the scavenger hunt. They are standing next to the nonfiction section for sports, and a shadow cut out of Drew Brees... Geaux Saints! :) (Picture 8). This display was mostly the idea of my coworker, who works in the teen department'. Terrific and fun idea, and one I'd like to adapt for my middle school library.